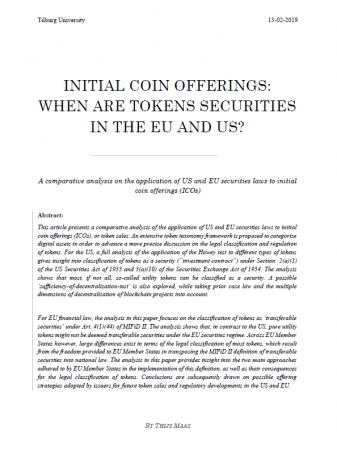 This article presents a comparative analysis of the application of US and EU securities laws to initial coin offerings (ICOs), or token sales. An extensive token taxonomy framework is proposed to categorize digital assets in order to advance a more precise discussion on the legal classification and regulation of tokens. For the US, a full analysis of the application of the Howey test to different types of tokens gives insight into classification of tokens as a security (“investment contract”) under Section 2(a)(1) of the US Securities Act of 1933 and 3(a)(10) of the Securities Exchange Act of 1934. For EU financial law, the analysis in this paper focuses on the classification of tokens as ‘transferable securities’ under Art. 4(1)(44) of MIFiD II. 2016 David Rountree Technology and contracts: Navigating the blockchain and the law. 2016 Philipp Paech Securities, Intermediation and the Blockchain - An Inevitable Choice between Liquidity and Legal Certainty?